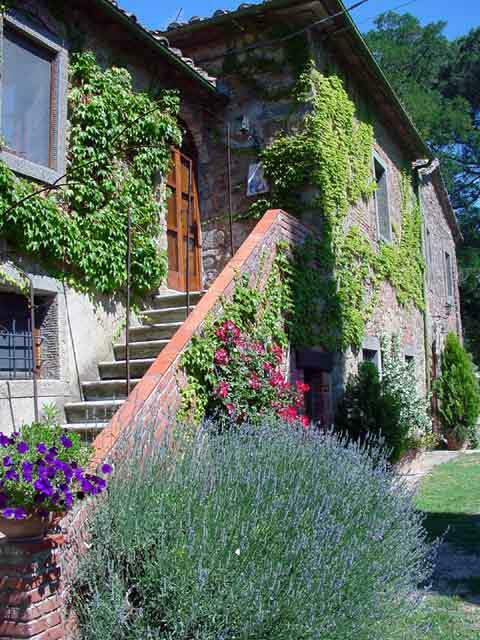 Villa 904 is a beautifully restored holiday rental property in Tuscany near border with Umbria, between Florence and Rome. 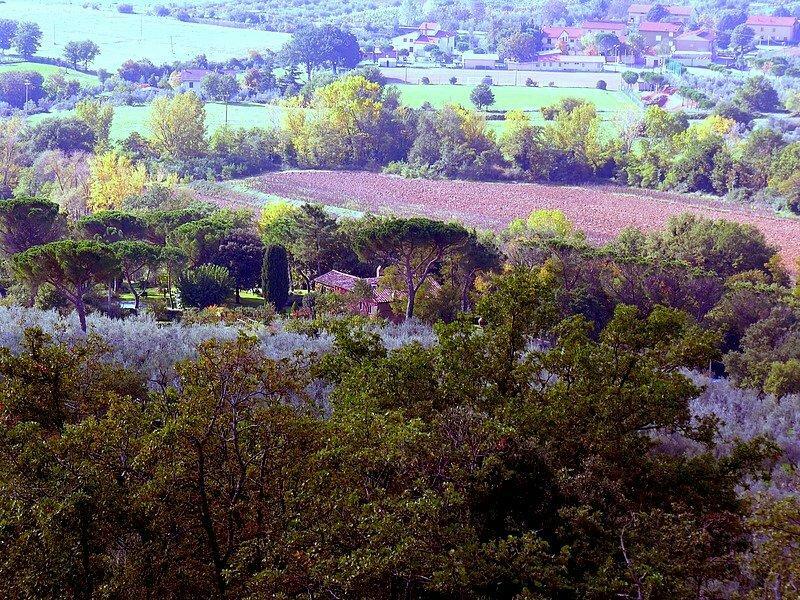 It is centrally located for tours of the wine regions of Siena and Montalcino and for exploring the ancient hill-top cities like Assisi, Perugia, Cortona, and Orvieto. 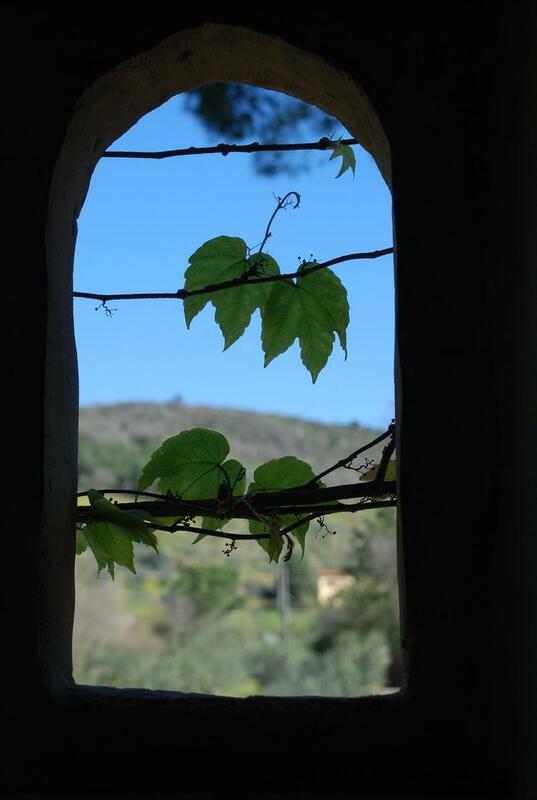 Experience a piece of history in a well restored 11th century villa, set within the ruins of the church of Sant'Andrea and the Colony of Women Lepers from the middle ages. 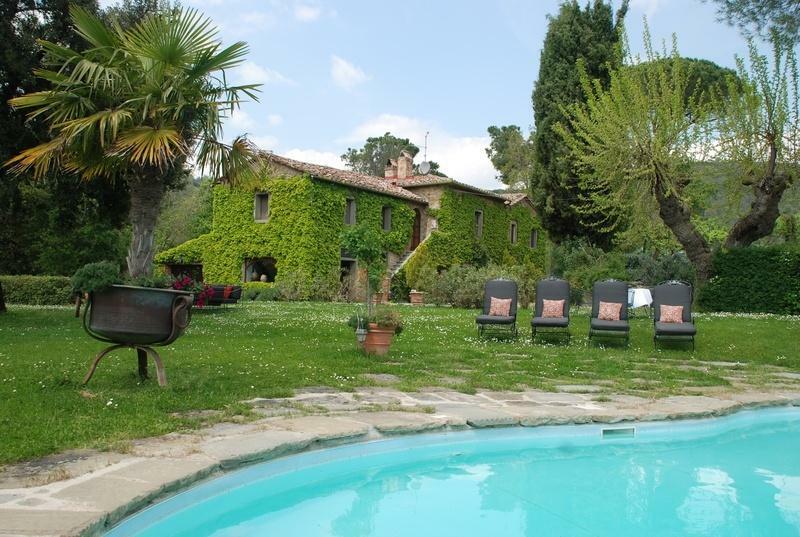 This historical 7 bedroom, 5 bathroom vacation home of 500 square meters (approx. 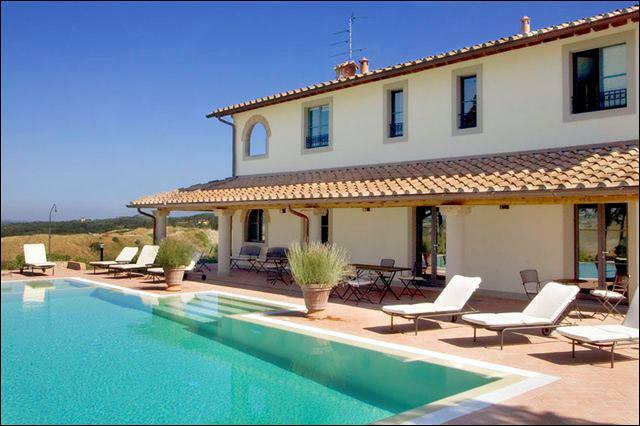 5000 square feet), has a swimming pool and guest house, all set on seven acres of private olive groves and fruit orchards. 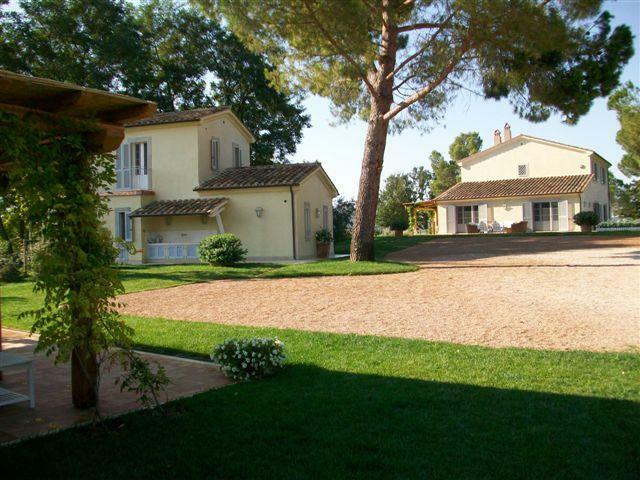 The villa will sleep up to 16 persons. However, we recommend that for your utmost comfort that there be no more than 10 adults in a booking party, and the remainder of the persons being children. Furnished graciously in decor with antiques, antique reproductions, oriental rugs, and original oil paintings, the villa reflects the integrity and serenity of the surroundings. 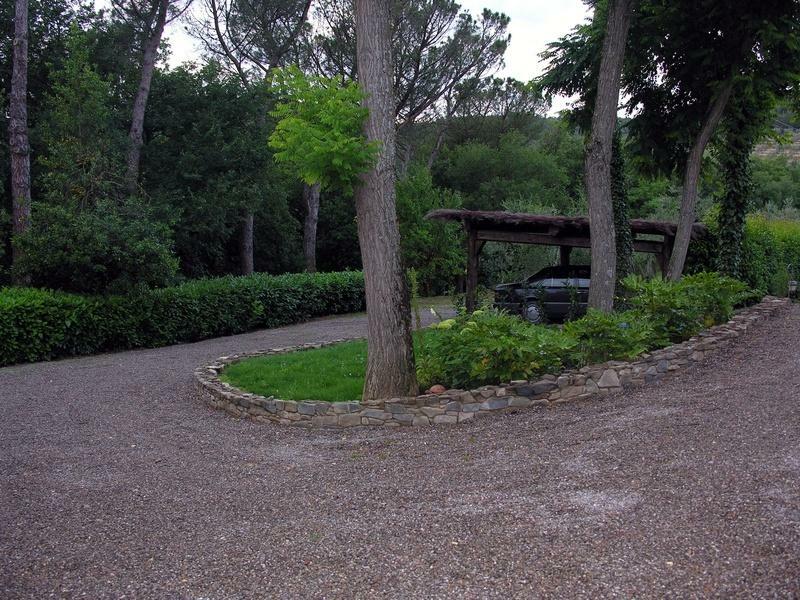 The spacious home is rented fully furnished on a weekly basis (from Sunday to Sunday). 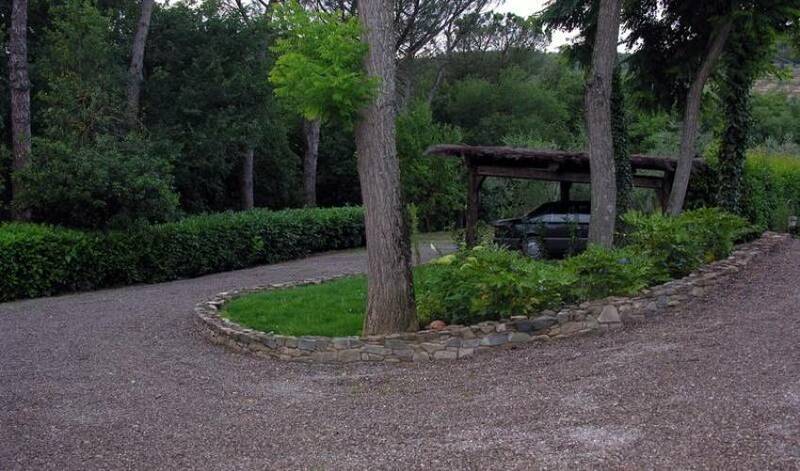 The Guest House can be rented in addition to the house but is not rented on a separate basis. 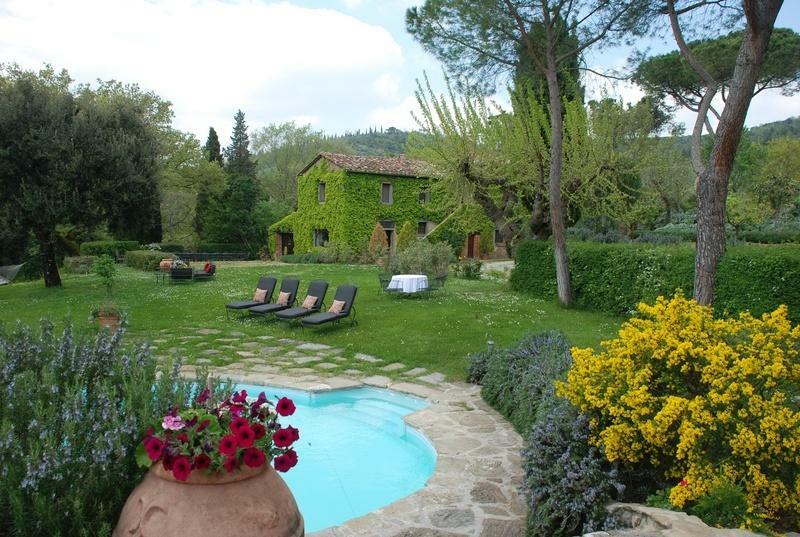 The prices listed include use of the Guest House. 1 king bed room with antique fireplace and private bath. Windows of this room look out over the garden as the sun rises, and is a beautiful spot for bird watching. The large antique beams of the cathedral ceiling accent the beauty of this former kitchen of the presbytery. 1 queen bed loft suite also with 2 single beds, one on the upper level and one on the lower level (connected to bathroom). It is called the room of the "Principessa" or "Princess". 4 full bathrooms each with shower (3 upstairs one downstairs) 1 spacious formal living room 1 large formal dining room with antique fireplace 1 large casual living area with queen sleeper sofa and game table (TV, VCR, Stereo). 2 Kitchens: Main kitchen including gas stove, electric oven, full size refrigerator, dishwasher, washer, dryer, small appliances, cookware, dish ware, silverware, glassware, and utensils. Portico kitchen including gas stove, electric oven, half size refrigerator, dishwasher, washer/dryer combination, large functional antique wood burning oven, small appliances, dish ware, glassware, cookware, silverware, and utensils 1 large casual dining area (Portico) 1 breakfast area with functional antique fireplace and carved stone sink (at Main Kitchen with TV, VCR). 2 TV's, 2 VCR's 3 Telephones, Linens Baby crib also available. A private cottage to the side of the swimming-pool, the guest house has it's own private full bathroom, compact kitchen, and stow away Murphy's queen size bed. There is also a daybed quite suitable for small children staying with parents. 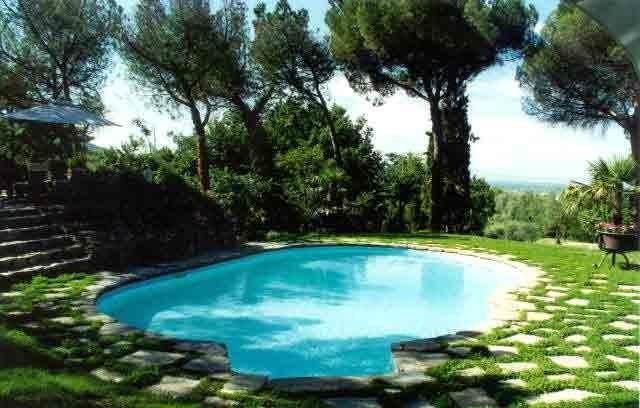 The roof top of the guest house serves as a pool terrace, which has a lovely view over the Valdichiana. The poolside terrace seems to be the choice spot for first coffee in the mornings. The Guest House accommodates two persons with a Murphy Style queen size bed, which disappears into the wall during awake time to allow for extra space. For parents traveling with small children there is also a double size sleeper sofa. There is a full bathroom with shower, toilet, bidet, sink and towel cabinet, and a window (shown here on the exterior photograph). 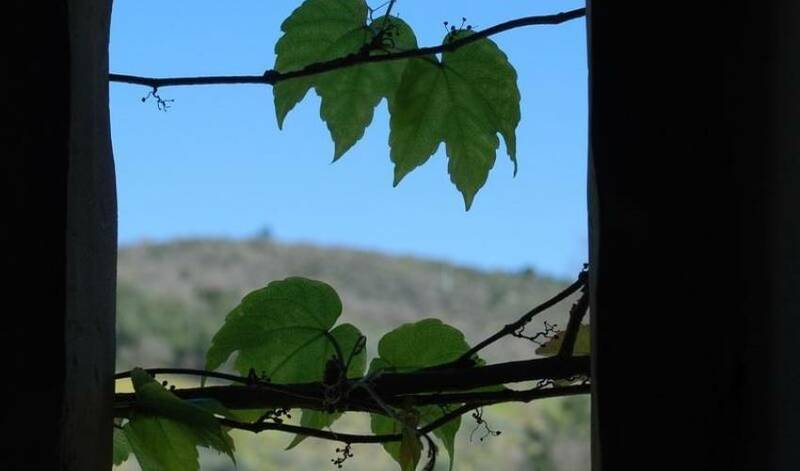 TV and linens are included, but there is no telephone located in the Guest House. The kitchenette has been made to save space as well, and although compact, functions wonderfully for light meals. The kitchenette cabinet contains a sink, two top electric stove, microwave, half size refrigerator, coffee maker, dish ware, glassware, and serving ware. Not shown in these photographs, there is also a granite countertop bar style dining area under the large picture window which serves as a great place for writing, eating or just gazing at the yellow daisy and pink hydrangea garden just outside the window. The Guest House is a new structure, built within the past two years. 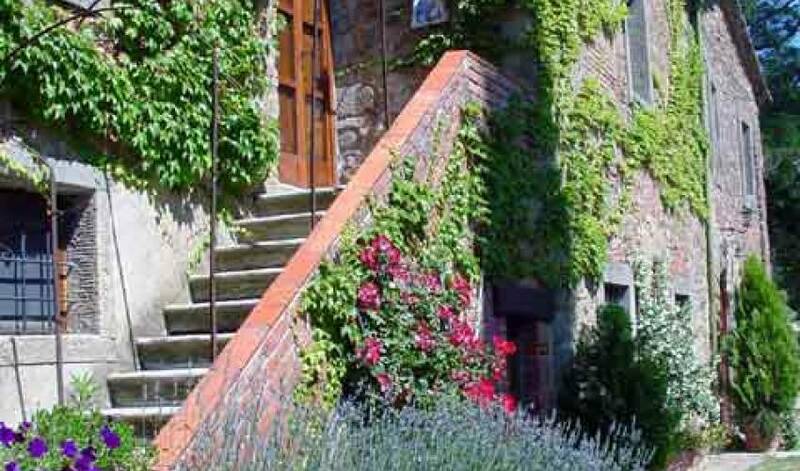 Every effort has been made to keep the new building in style and flavor of the 11th century main house. Stones used in the construction were taken from the restoration project of the villa and antique brick pavers from a nearby restoration work of another property were used in the interior of the ceiling. If one would not know that the building was new, few would be able to distinguish it's age. 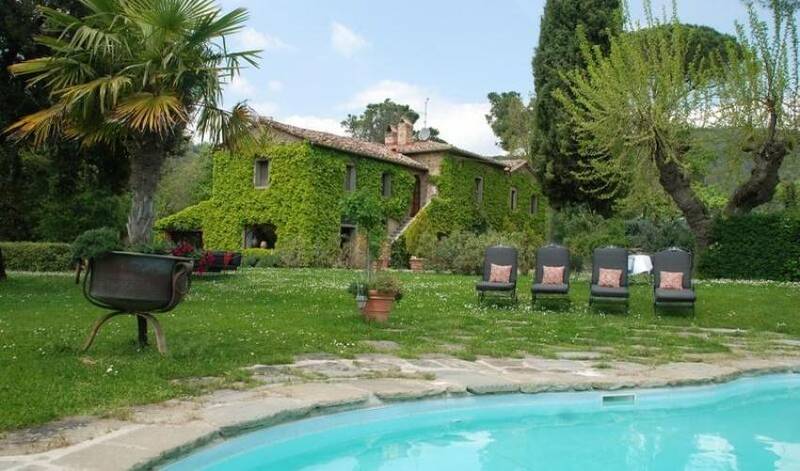 Near the border between Tuscany and Umbria, this villa is convenient to both Rome and Florence. 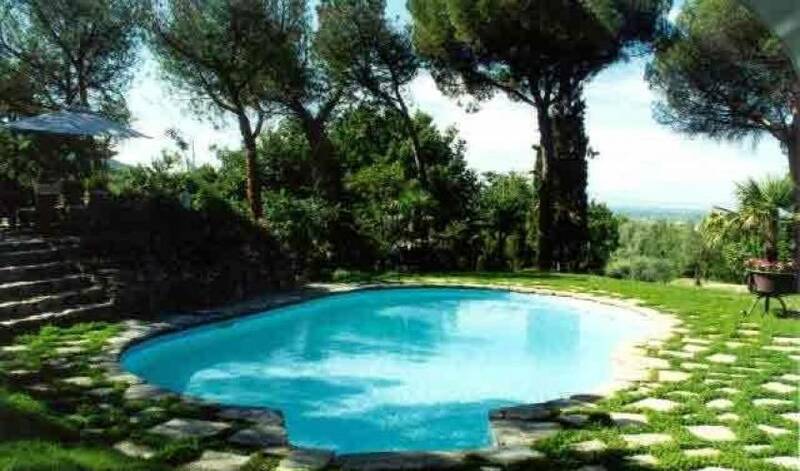 The villa is located a few miles south of Cortona, and is less than 1 mile to the center of Terontola which where there is a train station. 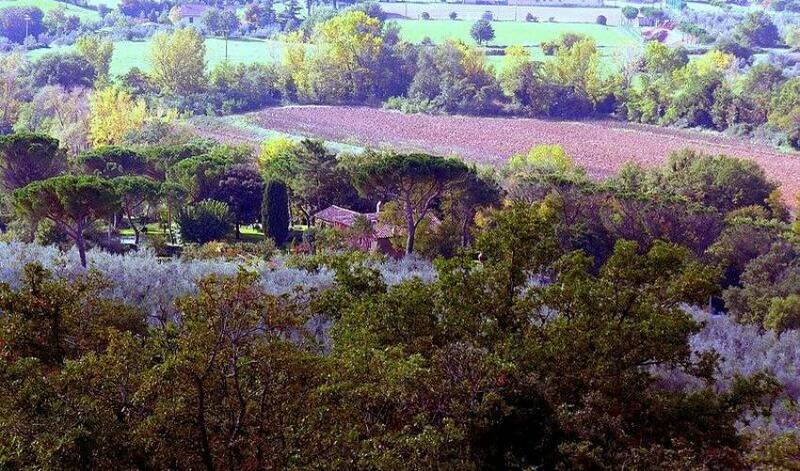 It is also about 4 miles to Castiglione del Lago, a very nice city on the shores of Lake Trasimeno. 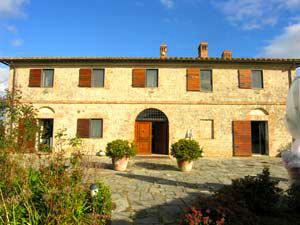 The property overlooks the Valdichiana and the beautiful Tuscan landscape sprinkled with cypresses, olive trees, vineyards and fields of sunflowers and red poppies.